You might well wonder why people didn't just buy the fastest film, and never have to worry about using a flash? As the speed of film goes up, so does the amount of visible "grain". Faster films were far more expensive (to make and to buy). Fast film could be too sensitive to light – you couldn't get fast enough shutter speeds to avoid overexposure. NB: "Grain" is the visible specks seen on photographs taken with fast films. They were often used to artistic effect. What's the digital equivalent of film speed then? So, lots of talk about the speed of film in the old days of photography. But what of digital photography? Naturally, we don't put film into our cameras any more, so why is knowing about film speed relevant? Well, we don't use film speed, but we do have a digital equivalent. And we still use ISO numbers too. The image on the left here shows a typical ISO selection screen on a digital camera. Many cameras, even compact cameras, will have ISO settings. 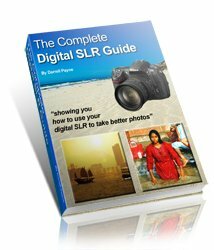 Some compact cameras, and all digital SLR cameras, will allow you to change them too. So what effect does changing that ISO setting have on a digital camera? Well, clearly there's no film in the camera; but what it does do is alter the sensitivity of the camera's image sensor. By adjusting the ISO upwards you make the image sensor more sensitive to light. This means you can still take photographs in low light without having to use shutter speeds so low that you end up with camera shake. And that would mean blurred photos! As the film speed (ISO) goes up, so does the amount of image noise. 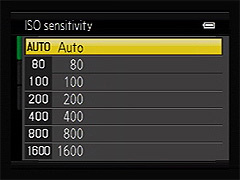 If you set the ISO level too high, the image sensor becomes too sensitive to light and you end up with overexposure. NB: image noise is the digital equivalent of 'grain' - it's a similar speckled effect of photos. But there are benefits too (hurray!). If you find yourself taking photos in low light, and it would mean you end up with a slow shutter speed, you'd normally end up with a blurred photo. But by increasing the camera's ISO you can make the camera more sensitive to light, and you can use a faster shutter speed – no more camera shake and no more blurred low light photos! And as for the consequences of image noise? Well, you may not notice this too much in the final print. And if you do, any image editing software will do a reasonable job of removing image noise. My favourite software at the moment is Pixlr. It's online, so you can access it anywhere, and it's free too.